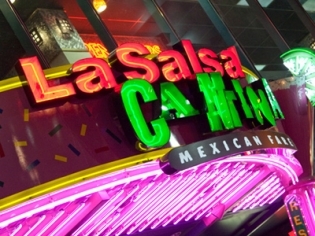 La Salsa Cantina is home to fajitas, enchiladas, tacos, ensaladas and so much more. This Mexican café located in the Miracle Mile Shops at Planet Hollywood is the place to experience Mexico in the Strip. Begin your adventure with a margarita “by the yard”, served in a souvenir glass, or one of the many tequila cocktails available for your pleasure. Try a fajita omelet for breakfast, a taco salad for lunch, and one of the many options of quesadillas for dinner. Whichever meal brings you in to La Salsa Cantina your service is sure to be fast and friendly. Had been there for breakfast. Had to wait around 30 minutes for 2 eggs with steak. No free refill coffee. Food was good but had better in other places.